// The application uses garbage collection, so no autorelease pool is needed. // Create a run loop observer and attach it to the run loop. // Create and schedule the timer. // Run the run loop 10 times to let the timer fire. // Set up an autorelease pool here if not using garbage collection. // Add your sources or timers to the run loop and do any other setup. // Start the run loop but return after each source is handled. // sources or timers, go ahead and exit. // done variable as needed. // Clean up code here. Be sure to release any allocated autorelease pools. // These are the CFRunLoopSourceRef callback functions. // RunLoopContext is a container object used during registration of the input source. // Create and schedule the first timer. // Create and schedule the second timer. // This class handles incoming port messages. 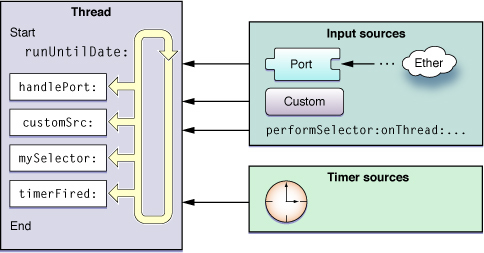 // Install the port as an input source on the current run loop. // Detach the thread. Let the worker release the port. // Handle responses from the worker thread. // Get the worker thread’s communications port. // Retain and save the worker port for later use. // Set up the connection between this thread and the main thread. // Let the run loop process things. // Retain and save the remote port for future use. // Create and configure the worker thread port. // Create the check-in message. // Finish configuring the message and send it immediately. // Configure the object and add it to the current run loop. // Register the port using a specific name. The name must be unique.